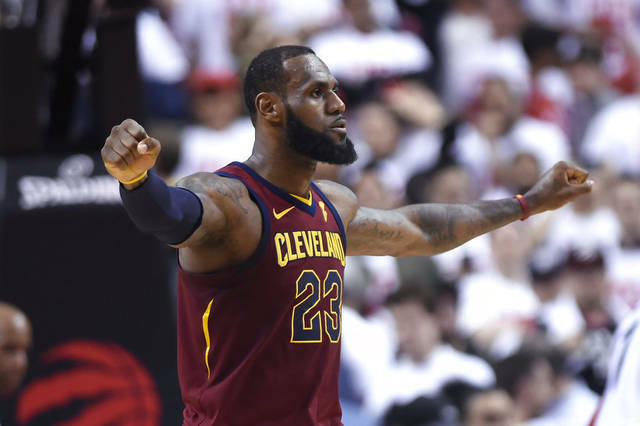 TORONTO — LeBron James had 26 points, 13 assists and 11 rebounds, J.R. Smith scored 20 points and the Cleveland Cavaliers beat the Toronto Raptors 113-112 in overtime on Tuesday night to win Game 1 of their second-round playoff series. Cavaliers: Cleveland allowed 100 or more points for the third time in eight postseason games. … James dove into a courtside broadcast table in search of a loose ball late in the fourth. … Love missed all four of his shot attempts in the first went 1 for 7 in the first half. … Kendrick Perkins traded angry words with rapper Drake, Toronto’s global ambassador, as the teams walked off at halftime. Former Raptors guard Jose Calderon stood in front of Drake during the exchange, while Smith moved Perkins toward the locker room.